This week we have a brief look at Hunter culture. 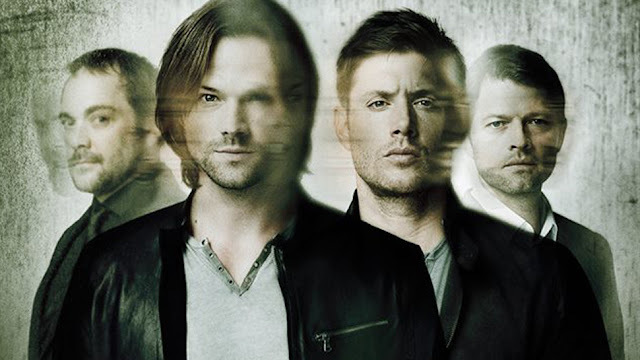 And I feel kind of like this has been a missed opportunity for this series – because the Winchesters have always been so separated from the greater Hunter collective. Until he died on the hunt. Now to the present when the Winchesters drop in on Jody! On the other hand, she’s on Supernatural so every episode she appears I wonder if THIS will be the one where she dies tragically and Dean gets to pull out his very-well-practiced-tragic-manpain-face (one day it’s going to freeze like that). Note that I didn’t put a conditional in that sentence. I am 90% sure that one episode Jody will definitely die for tragedy, we’re talking when, not it. I also feel sometimes that Jody is the reaction, the token. Many people, myself included, have criticised Supernatural for being an extremely male show (and white and straight) with most the female (and LGBT and POC) characters being dead. Jody’s (and crew) once-per-season appearance feels like a desperate token to dismiss all of that. There is a whole hunter community – but Dean and Sam have never really been a part of it because their dad considered it trouble. They arrive at Lorraine, Asa’s mother’s house, full of hunters drinking and partying and drinking and it’s a nice little snapshot of hunters and their funerary processes as they all play catch up, share stories (Asa is legendary – but the Winchesters cause more of a stir because they’re THE legends). This again makes me think that I’d really like to have seen more of the Winchesters in Hunter society. Long into the night until only a few hunters are left. And then Mary arrives which shows that despite the last two episodes Dean is NOT over her leaving them. But it does allow Jody to weigh in and, as ever, she has some excellent words of wisdom. She’s lost family, she’d love to see them again – but she recognises how scary that is. How frightening it is to realise you’ve changed a lot since you last saw your deceased loved ones, or how they may have changed – basically how this whole idyllic reunion may just so terrible fall apart. Jody, as ever, has a lot of excellent advice. Mary also has issues with Lorraine, Asa’s mother. After all, Mary was the one who inspired Asa to hunt. Mary is the reason why Asa never had a wife or family and ended up dying young Lorraine is not a fan. I don’t know it seems somehow more tragic that this legendary hunter was killed because he hit his head. As an aside to this, we have Billie the Reaper dropping in because she really wishes that dead people would stay dead. And now we have Mary – and my gods the Winchesters piss her off! She offers Mary a ticket back to paradise and hits the nail on the head about how completely out of place Mary is. She doesn’t fit, she isn’t comfortable and really isn’t happy with her resurrection. Despite throwing all that out on the carpet so we can truly see what Mary is feeling, she still decides to stay. But not with the brothers, not yet.